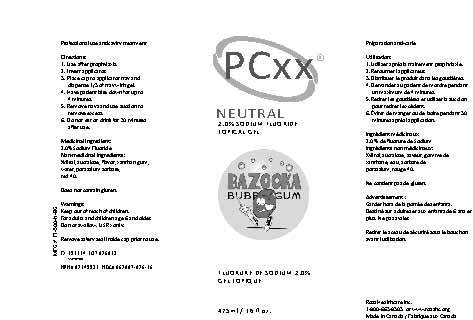 Proprietary Name: Pcxx Anticaries No Flavor Ne G What is the Proprietary Name? Pcxx Anticaries No Flavor Ne G with NDC 62007-835 is a a human prescription drug product labeled by Ross Healthcare Inc.. The generic name of Pcxx Anticaries No Flavor Ne G is sodium fluoride. The product's dosage form is gel and is administered via dental; topical form.